It’s been less than a year since I was in an underground bar in Hamburg watching Germans swig their drinks and throw their axes in honour of the just-finished Blackguards. But it seems Whispered World types Daedalic enjoy making classic RPGs so much that they’ve barrelled right ahead into their second. 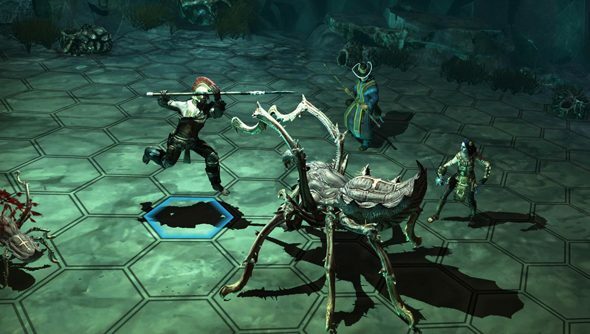 Blackguards 2 will bolt new bits to Daedalic’s engine and tinker with its turn-based combat. While Blackguards was a little iffy in its writing, it offered the best turn-based tactics and environmental manipulation in modern RPGs – at least until Divinity: Original Sin arrived and set all the furniture on fire. Blackguards 2 will expand on its best bits: ushering in larger and more demanding battle maps, more items scattered about them to interact with, and plenty of new enemy types to set fire to. It’ll feature a deeper implementation of the Dark Eye pen-and-paper ruleset, which has long backed up the best in German RPGs. And its missions will require your “whole strategic skills”, so don’t be playing Go on your phone under the desk or anything like that. Are you up for another RPG trying its hardest not to appear German?